Our Amish Kimberly Upholstered Chair will come straight from the rolling hills and rivers of Northern Indiana, where it will be handcrafted by Amish artisans for your home. Choose your fabric for this American made chair or upgrade to leather. The seat and chair back are upholstered for the ultimate in comfort and style. This comfortable dining chair has the perfect balance of firm and soft support in the upholstery. Shown here in brown maple wood with Celadon fabric, the Kimberly is graceful and stunning for your dining room display. Combining traditional and contemporary elements brings you a transitional style that will shine in your dining room. The Amish craftsman that builds these chairs also offers products such as bar stools and desk chairs. The LaGrange Amish Chair Collection is a family run business with a strong focus on quality construction, premium hardwoods and an emphasis on comfort. 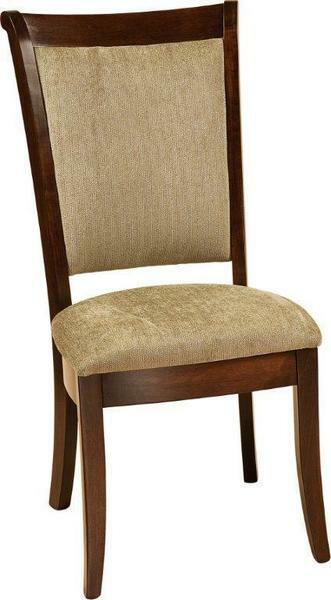 The Kimberly Upholstered Chair has mortise and tenon construction for increased durability and strength. Be sure to view the Kimberly Upholstered Swivel Bar Stool and the Kimberly Upholstered Stationary Bar Stool to enjoy this matching style throughout your kitchen and dining room. Visit our Amish furniture store in Florida to check out our dining room chairs in person!